The Fellowes Plasma 180 is an eighteen inch guillotine paper cutter that is designed to cut up to 40 sheets of 20lb paper at a time. The Plasma 180 is equipped with a heavy-duty stainless steel blade and includes an auto paper clamp to keep your document from moving during cutting. It has a foldable pre-assembled SafeCut Guard that prevents contact with the cutting blade and makes storage both safe and easy. The Fellowes Plasma 180 offers a solid metal base, non-skid feet and a 18 inch cutting length to help you complete all of your important projects. It even includes cutting guides for various paper sizes, photos and angled cuts. Check out the Fellowes Plasma 180 guillotine cutter today. Heavy-duty stainless steel blade cuts up to 40 sheets (20lb paper) at a time. Maximum 18” cutting width; solid metal base with non-skid feet. Automatic locking paper clamp ensures cutting precision. Adjustable back edge guide ensures precise repetitive cutting without realignment. The teachers were so excited to finally find a paper cutter that cuts straight, is easy to use, dependable and lasts a long time.With budget cuts, larger class size and less free time, convenience and durability are essential. Welcome to MyBinding video. Let's have a look at the Fellowes Plasma 180, an 18 inch guillotine style paper cutter. Let's watch the slick, easy to use paper trimmer in action. Simply lift up the paper shield and you're ready to go. Use the precise and plentiful measurements on the face of the table to align your papers. Should you need a fence for the project, it is equipped with two magnets that hold it down to the face of the plate. Snap the fence into the groove, lock it down by turning the dial at either the top or the bottom of your work area. It's time to trim. Slide your papers into the throat and down with the blade. The all metal blade cuts sharp and quick. This large plastic shield that you see is a safety feature. The blade must be all the way up to release your papers. As you swing down with the blade, it clamps down on the papers to hold them into place, making the slice. And you'll find that your papers can be locked down any length of the blade along the work surface. It's just that easy with the Fellowes Plasma 180 Guillotine Paper Cutter. For more demos and reviews of this product and many more, check out MyBinding.com. Transcript: Welcome to MyBinding video. 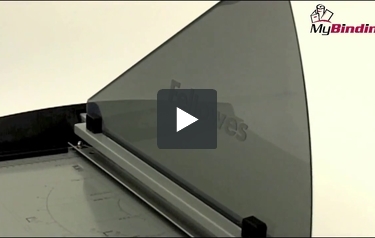 This is a review of the Fellowes Plasma 180, an 18 inch guillotine style paper trimmer. When it comes to paper trimmers, the Plasma 180 cuts as good as it looks. With our price point of under $300, it's an investment, but worth it. The construction is solid, safe, and will last a long time. Its base is made out of metal and is extremely durable. Cutting guides are printed directly on the face of the machine, as well as a protractor so you can make angled cuts. Rubber feet on the bottom keep the trimmer from sliding around. Welcome to MyBinding video. 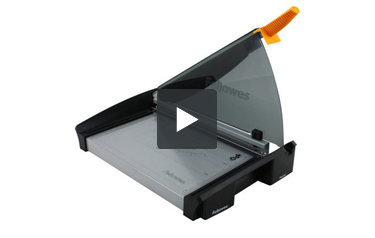 This is a review of the Fellowes Plasma 180, an 18 inch guillotine style paper trimmer. When it comes to paper trimmers, the Plasma 180 cuts as good as it looks. With our price point of under $300, it's an investment, but worth it. The construction is solid, safe, and will last a long time. Its base is made out of metal and is extremely durable. Cutting guides are printed directly on the face of the machine, as well as a protractor so you can make angled cuts. Rubber feet on the bottom keep the trimmer from sliding around. The fence is handy and portable. With two magnets on the bottom, the fence can stick any where on the plate that you might need. You can also snap it into the grooves at the top or the bottom, locking it down with the dial. The Plasma 180 has an 18 inch cutting length, so you'll be able to slice through letter and legal size paper with ease. The blade itself is made out of stainless steel. It is very durable and strong enough to withstand heavy use, so you can cut every day without any problems. In terms of safety, the cutter is equipped with a Fellowes safe cut guard, which is also a nice guide as you're trimming. The trimmer must be all the way to the top to release your paper. As you bring the blade down, it locks the papers in place. Cutting capacity is obviously a selling feature for all trimmers. The Plasma 180 boasts that it can cut through 40 sheets of 20lb paper. This was, however, a bit of an exaggerated boast. We found 10 and 20 sheets to be easy, 30 a bit of a struggle. However, 40 sheets was near impossible. We made it through but with great effort. And since quality and accuracy is important to you, you'll want to think in terms of 30 sheets. The trimmer is large and a bit bulky; however, it does have an 18 inch blade. So if you need a full size guillotine style paper trimmer, the Plasma 180 by Fellowes could be your best bet. For more demos and reviews of this product and many more, check out MyBinding.com. The primary reason to purchase a guillotine paper cutter is so that you'll be able to cut a large number of sheets at one time. That's definitely the case with the Plasma 180. It has a 40-sheet cutting capacity so you can cut as much paper as possible very quickly. This cutter can be used with different sizes of paper. It has a 18-inch cutting length so you'll be able to slice through letter- and legal-sized paper with ease. You'll even be able to work with tabloid-sized documents that are 11" x 17". The Plasma 180 has a very durable blade that's been made out of stainless steel. The blade is strong enough to withstand heavy use so you can cut everyday without any problems. As far as safety features go, this cutter is equipped with Fellowes' SafeCut Guard. This is a metal shield that keeps your fingers far away from the blade so you don't end up cutting yourself. The SafeCut Guard can fold down when you're not using the trimmer so you'll be able to store it more easily. The Plasma 180 has a base that's made out of metal, making it extremely durable. There are cutting guides printed on it, as well as a protractor so you can make angled cuts. Also, the base has rubber feet on the bottom of it so the cutter will stay in place when you're using it. Your materials will remain in one place and won't fan because this device has an automatic paper clamp. This feature ensures that your documents will be cut just the way you want and you won't end up trimming too much or too little off. The Plasma 180 is one of the more affordable guillotine cutters on the market. It retails for less than $350.00 so you can have a high-quality trimmer without parting with a lot of cash. Finally, this device's blade is backed by a 10-year warranty. Every other part of this device is under a 2-year warranty. Due to its cutting length, this device is pretty big. With approximate dimensions of 5" (height) x 14" (weight) x 30" (depth), you might have some trouble finding room for it. Also, since the cutting length is 18", you can't use this device with really large sheets of paper. The Fellowes Plasma 180 is a first-rate guillotine cutter, especially for such a low price. While it's designed for use with paper that's 18" long or less, this device would be a great choice if you need a new cutter. It's made out of high-quality materials and it's very safe to use. So if you're in the market for this kind of product, be sure to check out the Plasma 180 today. Is the condition on this item "new?" Yes, it is new. All machines and supplies on our website are new unless specifically noted as "Refurbished" or Open Box". Open Box items are demonstration models that have been inspected by a technician which still carry the full manufacturers warranty.